Dog owners, however, like everyone else, are accustomed to thinking about mosquito bites as something self-evident. But it is a big misconception since mosquitoes are not harmless at all and contacting them may have severe health implications for pets. Not everyone knows that it is female mosquitoes that bite both humans and animal, which is due to their biological need for proteins contained in blood to produce offspring. That is why they are so aggressive and persistent. As you probably know, these insects become particularly active in the evening and in areas with a high level of humidity. In other words, in parks, wooded areas and lawns where we like so much walking our dogs. And this is where the pets become a prime target for bloodsuckers. What kind of dogs are especially strongly affected by mosquito bites? These are short-haired and sheared dogs as well as very young puppies and old dogs. Also, immune-compromised pets are at a higher risk. They are more sensitive to such kind of attacks but other breeds are actually no safer. This is why a pet owner should take all necessary precautions to protect your beloved animal. This primarily involves having a mosquito repellent for dogs at hand. 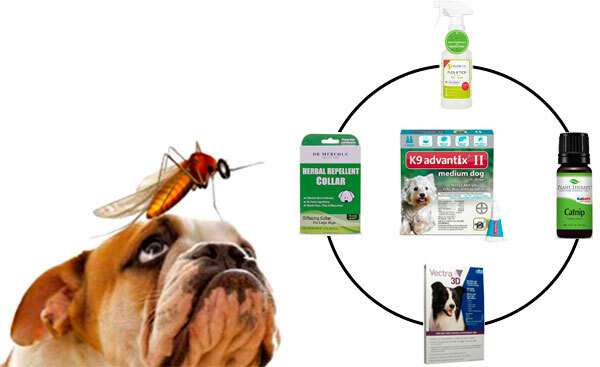 In this review, we will examine what type of the insect repellent for dogs works best and is suggested by scientists, in particular, we will cover the effectiveness of the mosquitoes spray for dogs. We will try to make sense of the issue of whether a natural mosquito repellent for dogs is really safe as some sellers claim. In addition, we will have a look at types of the mosquito repellent for cats available on the market. For your convenience, there is a comparison table of the products’ effectiveness and a review of the most popular products. For dogs older than 7 weeks and weighing over 20 lbs. Based on permethrin. For dogs. Based on lemongrass, cedar, and sesame. Can be applied directly to the skin. For cats. Repels mosquitoes and adored by cats. Scientifically proven effectiveness. First of all, it is worth knowing that when biting a mosquito injects its saliva into the skin which, in turn, causes symptoms we all are so familiar with, namely itching, skin irritation and swelling. Quite often this does not raise any health concerns, apart from some discomfort caused by itching, unless the attacked dog suffers from allergies. In case the sensitivity reaction is longer and more pronounced than usual, more drastic measures should be taken. Another unpleasant consequence of a mosquito bite for dogs is a severe itching. As a rule, the hurt animal in such cases scratches itself too much and constantly licks the wounds. What the owner should do in such cases is to prevent this behavior of the pet, since this may well result in an ulcer on the spot of the bite. If this has happened, contact your local vet. Scientists at Mississippi State University single out a more dangerous threat — the pets’ role in spreading mosquito-borne diseases like malaria, heartworm, fever, tularemia, and the like. Most of these diseases may be transferred from pets to humans. For example, in Southern Europe, dogs are known to be the main carrier of dirofilariasis. At the same time, it is worth noting that there are no single means of protection against all diseases transmitted by pets. So, in Mississippi, many pet owners have their dogs on heartworm preventative but this does not protect against other mosquito-borne diseases. Most solutions affect the nematode when it is already in the dog’s body but do not repel the mosquitoes carrying the disease from biting. Whereas it is bloodsuckers that are actually a source of the problem needed to be eliminated. Keep your dog indoors at dawn, in the twilight and early evening. This is the time of mosquito peak activity. Remove containers with the stagnate water around the house. Apply a repellent but only a registered and approved one. Be sure to a label direction before purchasing a product since not all of them fall into a category of the mosquito repellent for dogs. Moreover, some solutions may even harm your beloved animal. At present, there are just a few products labeled for such purpose. They can be purchased from a local pet shop, veterinary office or. What kind of repellents are best for dogs? 1. DEET – No. The first lesson that needs to be learned is that you should not apply insect repellents meant for humans on pets unless they are labeled for animals as well. The Illinois University’s scientists argue against applying DEET to pets and urge to avoid using this solution which is so popular among people. They claim that this compound, which was developed as far back as the 1940s and currently is considered to be the standard mosquito repellent, may cause severe adverse effects both in dogs and cats. Specialists at Cornell University Hospital for Animals Pharmacy have revealed that this chemical penetrates through the skin in dogs posing hazards to the animal’s health. 2. Permethrin – Yes. At the same time, another widespread mosquito chemical repellent, permethrin is believed by scientists to be effective on dogs and can be safely applied to your pets. This compound works not just a repellent but also an insecticide killing mosquitoes on contact. One of the benefits of using this stuff is that it is poorly absorbed by the skin. And yet, it is intended for applying to clothes, collar or any fabrics, rather than directly to the skin. So, scientists at Mississippi University advocate using products comprising this ingredient. They cite a research showing that a 65% spot-on formulation reduces landing rates of these bloodsuckers by 96.3% after the solution was applied to dogs. ‘Permethrin is the main ingredient in both K9 Advantix and Vectra-3D, the only two monthly topical products currently proven to actually repel mosquitos on the canine. Vectra-3D consists of dinotefuran and pyriproxyfen, in addition to permethrin, and is proven to cause an over 80% reduction in mosquito landings,’ the researchers note. According to another research, a combination imidacloprid + permethrin in the ratio of 10% to 50% produce almost a 95-percent repelling effect on dogs. This suggests that products with this ingredient stand a good chance of safeguarding your pet from mosquito-related hazards. 3. Picaridin – Yes. One more solution suggested by experts is based on a chemical substance picaridin. As scientists at the University of Maine put it, its ingredient is believed to bring the same result as DEET but with much lower toxicity. Nor does it destroys plastic surfaces or fabrics as it is the case with some chemicals. One of the strong points that matter in case of the product’s application to animals is that it is almost odorless. More importantly, picaridin does not cause allergic reactions which are typical implications of DEET-based products application. However, the experts make a reservation that this chemical obtained from the pepper is relatively new, therefore, not all of its potential adverse effects may have been revealed yet. Tests have confirmed that the insect repellent for dogs which is based on this ingredient is really safe for the treated animals. Scientists at Oregon State University Extension say that over the course of such tests, dogs demonstrated no adverse effects at any dose of the applied picaridin. The substance was placed at doses of 50, 100, or 200 mg/kg on the dog’s backs every weekday during a year. As a result, no dermal toxicity was recorded. Perhaps, the critical level starts at a dose of 200 mg/kg per day which should be definitely avoided. Is Natural Mosquito Repellent For Dogs Safe And Effective? There is a common misconception that everything natural is safe. Actually, it is true for some products and is wrong for others. The key factor here is the knowledge of the animal’s biology since some naturally derived substances may harm your pet much more than any chemical compound. Now, let’s have a look at what main natural ingredients are used in products deterring mosquitoes. To begin with, this is the oil of lemon eucalyptus which is based on plant-derived substances and, unlike most of the natural solutions, is considered to be almost as good as chemicals, according to researchers at the University of Maine. Still, it has a much shorter effect and shows the effectiveness equal to just 20% of DEET, which is quite a low concentration. Despite its natural origin, oil of lemon eucalyptus should not be used on small children and it is known for its side effect of considerable eye irritation. Secondly, there is such product as citronella which is derived from two kind of grass native to tropical Asia. It is advertised as a pest repellent but, in fact, provides insignificant protection from biting insects. Thirdly, these are essential oils comprising the following ingredients: oils of peppermint, catnip, geranium, and the like. They are thought to have a repelling effect on mosquitoes but work for a very short period of time and are claimed to be ineffective against biting pests. Along with that, scientists at the University of Illinois warn against using citrus oil extracts as well as other essential oils on animals since some of them are extremely sensitive to these substances. Researchers at Cornell University’s College of Veterinary Medicine confirm that essential oils are toxic to dogs. The Veterinarian’s Money Digest provides a list of oils which may entail adverse reactions in dogs. These are oils of clove, juniper, garlic, rosemary, thyme, and tea tree. Specialists from Okaw Veterinary Clinic insist that repellents based on cinnamon oil or citronella oil can be “irritating and very harmful,” especially when ingested orally through licking. Dr. Charlotte Flint, Associate Director of Veterinary Services at Pet Poison Helpline, specifies that essential oils contain chemicals that are quickly absorbed through the skin and orally. Most of them are metabolized by the liver, therefore, for puppies and dogs with liver disease, these products pose an obvious hazard. In addition, some essential oils can burn the mouth and skin, even though a small amount of the liquid was applied to the animal’s skin or licked by it. The symptoms of poisoning are vomiting, difficulty breathing, muscle tremors, drooling, skin redness, and other. What Is The Best Mosquito Repellent For Cats? Cats are more sensitive to all sorts of substances, therefore, we should better to start with what you must not use as a mosquito repellent for cats. First of all, this is DEET. Scientists from Oregon State University say that clinical signs of toxicity in cats caused by this compound often include vomiting, excitation, tremors, seizures, and ataxia. There are numerous cases of neuro-toxicity in cats recorded following the topical use of such products. Another mosquito repellent that you must avoid applying to cats are essential oils. Keep in mind that cats are even more sensitive than dogs and particularly to naturally-derived substances. The Veterinarian’s Money Digest specifies that cats have an enhanced sense of smell and their livers fail to metabolize certain compounds present in essential oils. So, keep your cats away from oils of citrus, eucalyptus, peppermint, clove, spruce, lemon and some other. As experts at Cornell University Hospital for Animals Pharmacy put it, the only smell of peppermint is highly toxic to cats. Now, what do scientists recommend? Iowa State entomologists have revealed that catnip oil can be a perfect mosquito repellent. They have found out that catnip oil wards off these bloodsuckers much better than many other commercially available solutions. Thus, a catnip plant, which is known for its stimulating effect on cats and which is so adored by them, is also a safer and quite an effective mosquito repellent. We have examined all commercially available products warding off mosquitoes from dogs and cats and have picked these five items as the most effective solutions according to scientists. These are two specially designed for dogs chemicals containing permethrin as an active ingredient in different combinations. There are also two natural solutions for dogs based on essential oils — a spray and collar. As for cats, scientists suggest using catnip oil which is a safe and well-known means of deterring mosquitoes. K9 Advantix II is a best-selling and time-proved product from BAYER, a worldwide renowned pharmaceutical giant. It is a mosquito repellent designed for dogs only and there are several options of the product designed for the different size of the animal. With the ingredients including permethrin and imidacloprid, it is suggested by veterinarians and scientists as a good protection against these bloodsuckers. However, be careful not to apply it to cats as the solution may be even lethal to them. Nor should you use the product on dogs younger than 7 weeks. The solution not only repels an insect but also kills it on contact before it bites. When applying the solution, be sure not to make it contact the dog’s mouth or eyes. Also, a pet may exhibit individual sensitivity, therefore, in case of any signs of the dog being sick, immediately contact a veterinarian. The substance will not be washed out in the rain, therefore, feel free to walk your pet under any weather condition with guaranteed protection from mosquito bites. Furthermore, it is a long-lasting insect repellent with up to a month of protection. Its rating is 3.9 out of 5 stars, with more than 6,400 customer reviews. “My dogs can run freely offer the leash but go into heavily wooded areas that are tick and flea and mosquito infested. This medication provides a monthly barrier against these threats,” a customer commented. There are four options for different size groups: 4-10 lb, 11-20 lb, 21-55 lb, and over 55 lb. This product, in a sense, works similarly to the previous one. It repels and kills bloodsuckers, it is waterproof and it can be applied to puppies as young as 7 weeks as well. The solution dries quickly, it is not greasy and produces an immediate result within two hours. From the customers’ experience, the product is odorless As it was mentioned above, Vectra 3D is suggested by scientists, with studies showing an 80% effect following its application. Its ingredients are the following: permethrin, dinotefuran, and pyriproxyfen. Since the product is classified as general use pesticide, not medications, it is overseen by the EPA and, therefore, does not require a prescription. However, it would be prudent to consult a veterinarian before applying the stuff on your pet. Different dogs react differently to the same solutions. As an example, one of the customers complained that his dog had had a severe adverse reaction to the product, which discouraged the owner to use the product again. Although this repellent rates higher than the previous one on — 4.3 out of 5 stars — it has gained fewer customer reviews. “I am more worried about mosquitos and ticks than I am about fleas. This is one of the few products that address those critters. My dog never scratches or itches so I would say nothing has been able to get to her,” a satisfied buyer says. We have described risks posed by essential oils to pets but if you have still opted in favor of natural solutions, try this one. Wondercide Mosquitoes Spray is made from 100% naturally derived ingredients and is handcrafted in the United States. Its ingredients include oils of lemongrass, cedar, and sesame. According to the label, you should spray the fur to repel or kill the bloodsuckers, however, do not direct it to mouths, eyes, and nose. In particular, make sure that the solution is applied to the belly, legs and tail. To treat the face, first, spray the repellent on a cloth and then wipe the face and ears. It can also be applied to items of furniture and the floor without staining them. Like any natural product, this one lasts for a short time. For this reason, it would be better to apply the stuff every two days before walking the pet in areas where mosquitoes are present. We should also turn your attention to the fact that the instruction allows using the product on cats, whereas scientists warn against applying on cats such essential oils as the lemon. So, we strongly advise that you should consult a veterinarian before treating your cat with it, or better still, avoid using it at all. The product may also pose the health risks to humans, so, a customer said that when the stuff contacted his skin, welt emerged all over his neck. Therefore, be careful with these widely promoted natural repellents. It rates 3.9 out of 5 stars, with almost 2,000 customer reviews. Perhaps the best choice for those unwilling to treat the fur of their pets with either chemicals or natural solutions is to take advantage of using specialized collars. Such is this plant-based collar deterring mosquitoes from a dog. The effect of one item lasts for up to 4 months. With a blend of oils contained in it, the collar can be put both on the adult dogs and puppies over four months old. Its ingredients are incorporated into the collar, which let them diffuse gradually, according to the seller. Also, the Herbal Repellent Collar is claimed to be endorsed by veterinarians for small and large dogs. Still, it does not rate high, scoring 3.5 out of 5 stars, with some 25% of the customers giving it just one star. So, one of the users wrote: “Does not work for mosquitoes as advertised. Mosquitoes kept landing all over my dog’s back and legs”. The other buyer notes that the collar did not work for him either and, moreover, it emits quite a strong smell. Well, it’s up to you to try this innovative collar or not. Anyway, the item is not expensive, so you can give it a try. Catnip is a preferred way of protecting cats against bloodsuckers. The thing is that cats are extremely sensitive to many ingredients, both chemical and natural, and it is hard to select an appropriate repellent which would not harm the anima. While catnip is a special thing which works on cats like honey for bees — they literary love it. Although currently numerous studies are conducted to develop an insect repellent based on catnip, its repelling effect is not something new. This herb was historically used as such, representing one of the folklore remedies. Present-day studies show that the catnip, when it is not fractioned, can be viewed as an effective tool to deter pests. This product contains a 100% pure catnip oil that has been tested and certified by third-party laboratories. So, rest assured that you deal with an absolutely pure product, without any fillers and additives. It rates 4.3 out of 5 stars, which demonstrates that people appreciate the product’s properties. “Works very well as a mosquito repellent,” a customer wrote. He suggested putting a couple drops in an odorless lotion, which, in his opinion, keeps mosquitoes away. Permethrin, imidacloprid, and pyriproxyfen. For dogs. Permethrin, dinotefuran, and pyriproxyfen. For dogs. Lemongrass, cedar, and sesame. Mosquito spray for dogs. Blend of oils. For dogs. 100% pure catnip oil. For cats.